Research by UCLA professor Kent Hill and graduate student Stephanie DeMarco, as well as colleagues at the University of Bern, could lead to new approaches to treat African sleeping sickness. Life scientists from UCLA and the University of Bern have identified a key gene in the transmission of African sleeping sickness — a severe disease transmitted by the bite of infected tsetse flies, which are common in sub-Saharan Africa. The disease is fatal if untreated, as the parasite responsible moves from the bloodstream to the central nervous system. Tens of millions of people in 36 African countries are at risk. There is no vaccine, and conventional drug treatments, which include an arsenic derivative, are antiquated, not very effective and have severe side effects. The research, published in the journal Nature Communications, could lead to new approaches to treat the disease. It also provides scientists with the first detailed understanding of how the parasite moves through the fly and what genes enable it to do so. The tiny, single-celled parasite that causes African sleeping sickness in humans, and debilitating diseases in other mammals, is called Trypanosoma brucei, or T. brucei. To become infectious, the parasite must travel through tissues of the fly, from the midgut to the salivary gland — and then into the human or other animal, through a bite. In the study, Stephanie DeMarco, a UCLA graduate student in molecular biology, and Sebastian Shaw, a graduate student at Switzerland’s University of Bern, worked with two sets of the T. brucei parasite. In one set, they made a mutation in one of the parasite’s genes, called phosphodiesterase-B1, or PDEB1. Then, they infected 2,000 tsetse flies with some 20,000 parasites each — half of the flies received blood containing normal T. brucei parasites and the other half received blood with the mutated versions. When tsetse flies drink infected blood, the parasites from the blood typically travel to the midgut and then into a tissue closer to the head, called the proventriculus, before moving on to the salivary glands. But the researchers saw a striking difference in the proventriculus between the two sets of flies. Among the flies that received the normal parasites, those that had parasites in the gut also had parasites in the proventriculus; but among the 1,000 flies that received mutant T. brucei, only a single one that had parasites in the gut also had a parasite in the proventriculus. 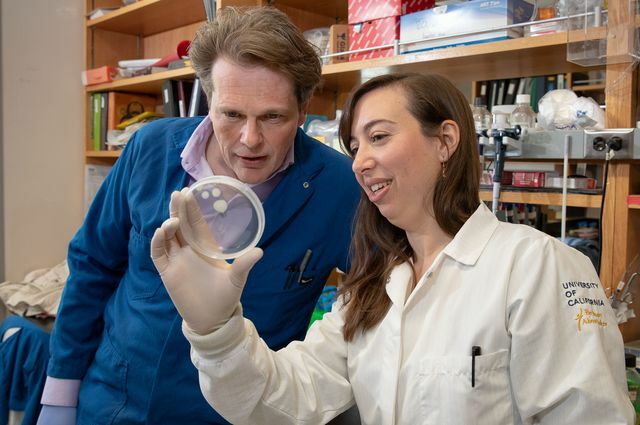 Kent Hill, a UCLA professor of microbiology, immunology and molecular genetics, and one of the study’s senior authors, said the findings also suggested that there must be a barrier preventing the mutants from getting from the midgut to the proventriculus. To learn where that barrier is, the scientists made fluorescent parasites and fed the flies a fluorescent dye that stained different tissues in the fly different colors, enabling the researchers to track the parasites. To go from the midgut to the proventriculus, the parasites have to cross the peritrophic matrix, a sheet-like structure produced by the proventriculus that protects the midgut. “We found the normal parasites could get through the peritrophic matrix just fine, but the mutants were mostly stuck on one side of it,” DeMarco said. That finding indicated that the peritrophic matrix was the barrier the scientists were looking for. The research identifies for the first time the genes that enable the parasites to sense where they are and allow them to survive their journey in fly tissues; those mechanisms had not been understood well until now. The researchers also uncovered another clue to African sleeping sickness: In parasites with mutated PDEB1, there was a dramatic increase in the number of cyclic AMP molecules, signaling molecules that play an important role in the disease. Normal parasites are social and coordinate their behavior, DeMarco said. But the research revealed that without PDEB1, the parasites have too much cyclic AMP in their cells and can’t communicate with one another. Hill said the new insights from the UCLA–Bern study could apply to other disease-causing parasites as well. For example, T. brucei parasites are related to parasites found in the U.S. and elsewhere that cause Chagas disease, in which parasites invade heart tissue, leading to inflammation and enlarged heart tissue, and in some cases, heart failure. Hill’s research is funded by the National Institutes of Health’s National Institute of Allergy and Infectious Diseases and the National Institute of General Medical Sciences. Roditi’s research is funded by the Swiss National Science Foundation and the Howard Hughes Medical Institute. 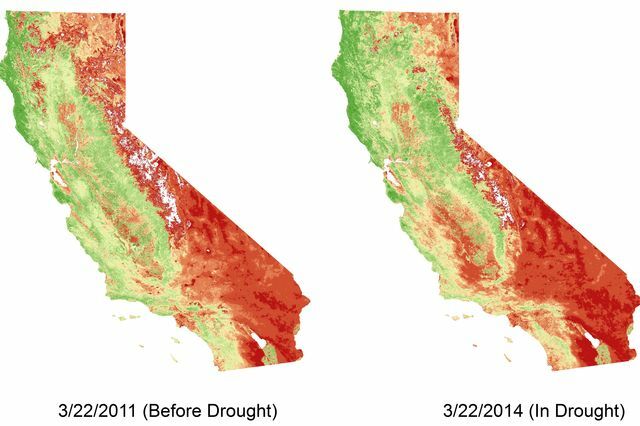 Vegetation density in California, 2011 versus 2014, when the state was in the midst of a drought that had especially severe effects in the southern part of the state. Like a climate chameleon, California turned brown during the 2012–16 drought, as vegetation dried or died off. But the change wasn’t uniform. According to research from UCLA and Columbia University, large areas of the northern part of the state were not severely affected, while Southern California became much browner than usual. That means additional stress will be placed on wildlife ecosystems and resources that the approximately 24 million people living in Southern California need to survive, including energy, food and water supply. The problem isn’t just a lack of precipitation. Hotter temperatures due to global warming — which accelerate evaporation and make drought effects worse — are playing play a major role in many locations, including Southern California and some parts of the Sierra Nevada. One band of low-to-middle elevation forest in the western Sierra was hit particularly hard and showed drastic browning, MacDonald said. That area of the Sierra Nevada experienced a high concentration of tree deaths, which contributed to California’s overall loss of more than 129 million trees since 2010. In contrast, some parts of California became greener — mostly at high elevations and in the far northwestern part of the state, where it’s cooler and moister. The researchers examined satellite images dating back to 2000 and historical records dating to 1895. They combined that data with information about drought severity and vegetation indexes — which analyze imagery to determine how densely green a patch of land is. The research was partially funded by UCLA’s Sustainable LA Grand Challenge, which seeks to develop informed strategies to transition L.A. County to 100 percent renewable energy, 100 percent local water and enhanced ecosystem health by 2050. Lead author Chunyu Dong, who worked on the project as a UCLA postdoctoral researcher, said the findings reveal a century-long trend in Southern California toward a drier climate that won’t affect only plants, but also the lives of millions of people. “The Southern California water shortage will be more severe in the coming decades, especially when we consider the population here is increasing quickly,” Dong said. The changes also have implications for wildfires, he added. Additional dry vegetation and hotter, windy weather could lead to more large fires that are difficult to control. That lines up with 2017 research by MacDonald, who used the natural climate record contained in ancient tree rings to understand how climate variability and droughts have changed over hundreds of years. That paper found that California is in an unprecedented scenario in which the climate has warmed at the same time that variations in temperature and precipitation have been magnified, supporting rapid plant growth in wet years and then drying in hot summers, which provides more fuel for wildfires. The 2019 rainy season made California drought-free for the first time since 2011, greening the state and causing wildflower superblooms, even in deserts. But MacDonald said the relief could be short-lived. How climate change and drought will reshape the state’s vegetation in the long term remains to be seen. Some coastal sage scrub and chaparral could be replaced by grasslands, and low-elevation shrubland and woodland might even replace some coniferous forest, MacDonald said, but more study is needed. Shane Campbell-Staton, shown in his UCLA office, says comic books offer a fantastical look at biological concepts. 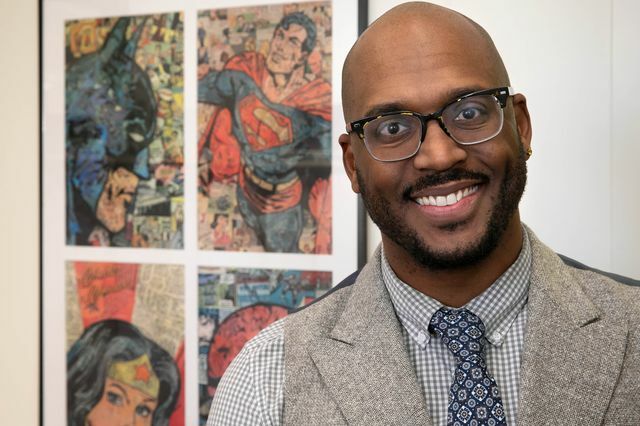 While Shane Campbell-Staton was working on his dissertation at Harvard in 2013, he walked into a comic book store in Cambridge, Massachusetts, and saw a comic in which Superman fought Muhammad Ali. That was the first comic book he ever bought. An evolutionary biologist, he spent his days writing about the evolution of a small green lizard that adapted from a warm, sub-tropical environment to the cold winters of Tennessee, North Carolina and Oklahoma. Before going to sleep, he read the comic book as a guilty pleasure. Campbell-Staton became curious about other comic book universes, and returned to buy a couple of other superhero comics, which he also read before falling asleep. He started to have strange dreams that combined the biology he was thinking about with the comic books he was reading. He had a dream about the Flash – the fastest person in the world whose super speed is coupled with superhuman reflexes – running faster than a bullet. Campbell-Staton woke up thinking about muscle fiber, friction and metabolism — things that fuel a body. Campbell-Staton started his popular Biology of Superheroes podcast in late 2017, which was a top 20 iTunes science and medicine podcast this January. This quarter he is teaching a new “Biology of Superheroes” course for juniors and seniors in the life sciences. He uses superheroes such as Batman, Captain America, Black Panther and Wonder Woman, as well as Jurassic Park and zombies, to teach his students the biology of aging, genetics, evolution, genetic engineering, biotechnology, artificial intelligence, the ethics of reviving extinct species, parallel universes, intelligent alien life and how biology shapes modern society. 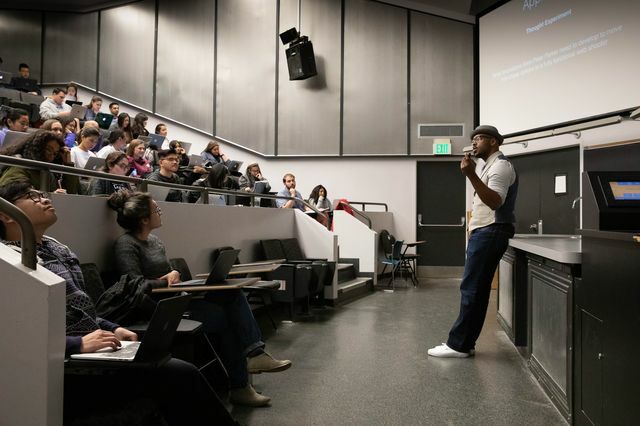 Shane Campbell-Staton teaches his “Biology of Superheroes” course at UCLA. Students read peer-reviewed research journal articles, chapters from science books and comic books. They can create their own science fiction or superhero podcast for their final project, or write a paper or a superhero short novel. Campbell-Staton said he would like to include some of their podcast material on his podcast. Campbell-Staton said he wants to push students to think about biology in ways they typically would not. “Usually, we learn the biology of plants and animals. This class is refreshing and cool,” Fayt Sarreal said. Student Andy Duong said Campbell-Staton cleverly weaves science into the superhero discussions in a creative and engaging way. In a recent class session, Campbell-Staton raised a question posed by Harvard biologist Stephen Jay Gould (who died in 2002): If you replay the tape of evolution, will you repeatedly get the same results or different results? The consensus among the students was the results would be different. One said the six-mile-wide asteroid that crashed to Earth 66 million years ago, wiping out the dinosaurs and approximately 75 percent of the world’s animal and plant species, might miss the Earth in an alternate scenario, and if so, the dinosaurs likely would still roam the Earth. The 2018 movie, “Spider-Man: Into the Spider-Verse,” addresses this question with alternate universes. The character Peter Parker is Spider-Man in one universe, while Gwen Stacy is Spider-Woman in another universe. The same characters appear in different universes, but as a superhero in one universe, a normal person in a different universe, and a supervillain in another universe. The role of determinism in evolution is a lively, ongoing debate in evolutionary biology — one this movie explores through the lens of the multiverse, Campbell-Staton said. Gould argued that replaying the tape of life repeatedly would yield different results, likely not including humans. An earlier class session covered whether elite athletes have to be extraordinarily gifted genetically. Campbell-Staton discussed specific gene mutations that influence endurance and muscle strength. He plans to teach the “Biology of Superheroes” each year in winter quarter. When Campbell-Staton was in high school, he took a memorable course on myths and legends that delved into broader issues. “That always stuck with me as a unique and enjoyable learning experience that forced me to push myself,” he said. The researchers rank in the top 1 percent in their fields in producing widely cited studies, indicating that their work “has been repeatedly judged by their peers to be of notable significance and utility,” according to Clarivate. “Morton’s leadership and philanthropy are testaments to his belief that the true measure of a life is not what you get, but what you give,” said UCLA Chancellor Gene Block at the medal ceremony. Kevin thanks his mother’s persistence in pursuing her own education coupled with his father’s humble nature and drive to provide a safe and secure life for his family for molding him. UCLA faculty voice: Separating children from parents at the border isn’t just cruel. It’s torture. Children arriving at the U.S. border in search of asylum are frequently a particularly vulnerable population. In many cases fleeing violence and persecution, they also encounter hunger, illness and threats of physical harm along their hazardous journey to the border. The program will provide year-long support for underrepresented minority pre-med students and offer an innovative curriculum that includes seminars, filmmaking and bench research focused on environmental variables contributing to health disparities. Elaine Hsiao, UCLA assistant professor of integrative biology and physiology, and Hosea Nelson, UCLA assistant professor of chemistry and biochemistry, are among 18 outstanding young scientists in the U.S. to be awarded Packard Fellowships for Science and Engineering by the David and Lucile Packard Foundation. The restoration and improvements made possible by the donation will enhance research and teaching on plant, conservation and environmental biology in the UCLA College’s department of ecology and evolutionary biology.